As Kate has been wrapping up the work on her Yokes book, we've been emailing back and forth a fair bit. I realized in all this discussion of yoked sweaters that it had been ages since I'd worn my Owls (Kate's first yoked design), and so I decided it was time to pull it out of the closet and give it a good wash.
Now, I'm going to let you in on a dirty little secret: until I started designing, I was hopelessly lazy about knitting garments. That's not to say that I didn't knit garments, because I did, but I rarely swatched for projects and almost never blocked anything I knit. On occasion, this totally bit me in the behind (students of mine have heard me describe the foolish inital steps of my Sundottir prototype). I eventually learned my lesson, and I now knit swatches for both stitch pattern and gauge whether I'm working on a pattern sample or just a personal project, and everything always gets blocked. But still, it took me awhile to get there. 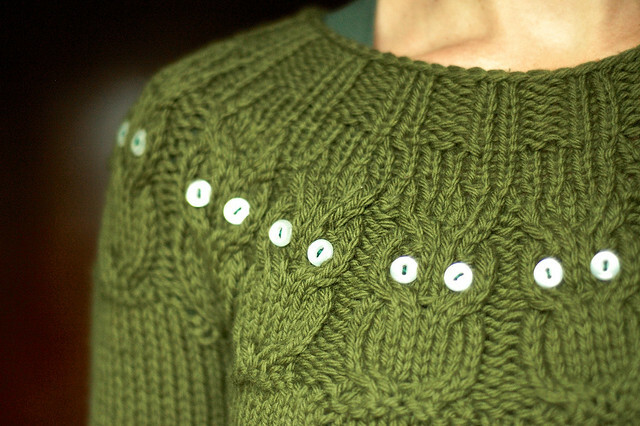 I knit my Owls in 2009, and it was the second garment I'd ever knit. 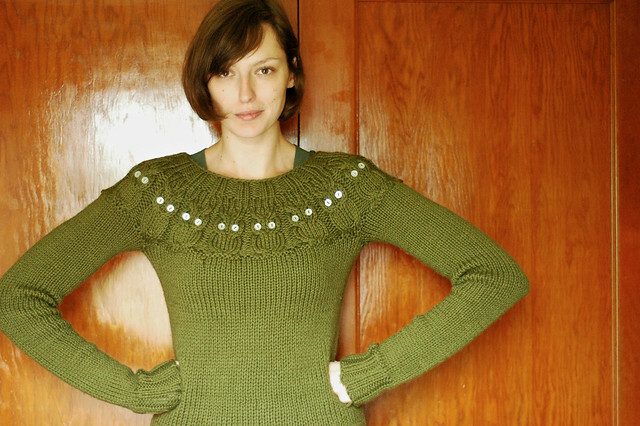 There were a lot of firsts in there, too: it was my first yoked sweater, my first seamless garment, and my first time using short rows, among other things. Having shared my dirty little secret about Past Me's garment knitting habits, I am only a little bit embarrassed to tell you that until last week, this sweater had never been soaked and blocked (funny enough, I did actually swatch for this one - but it was just a small swatch to try out one of the owl cables). I wore it quite a lot in the year after it was finished, but then it found its way into the closet and basically stayed there. I had decided it wasn't all that comfortable to wear, being somewhat stiff and scratchy, and I had knit more sweaters that I was more fond of by this point. Knit during my last year as an undergrad, prepping for a cross-country move on a student budget, my yarn shopping budget was limited, so I chose to knit this up in Knit Picks Wool of the Andes Bulky in Oregano, which while neither luxurious nor particularly hard-wearing is a perfectly serviceable yarn. Never having been washed and blocked after being knit up, though, it wasn't entirely comfortable (for the record, the soak and blocking I gave this sweater last week really helped with that). Do you know why you should always wash and block your gauge swatch? The answer, of course, is that blocking typically affects gauge in one way or another. Not having knit or blocked a swatch, I really had no idea what would happen to my Owls, size-wise, when I did wash and block it. As it turned out, my stitch gauge stayed more or less the same, but my row gauge changed dramatically. This sweater fit well when I first finished it, and it still fits well, but it's quite a lot longer. I was somewhat amused when I laid it out to dry and realized that it was going to be somewhere between its original length and tunic-length, and that the sleeves looked comically long. Both sleeves and body gained several inches of length. Where before, they stopped right at my wrists, they're now long enough to slide down and cover most of my hands - a cozy effect, if unintentional. Being six feet tall with somewhat skinny, gangly arms, I'm happy to say I don't mind the extra length at all (fortunately!). If you'd like to compare, scroll down past the first four photos on my Ravelry project page to see the older photos. On me, this type of shaping works much better when the sharp decreases start further down the hip, but then I imagine that I have a longer torso than Kate. Had I been a shorter knitter, though, the length I gained when washing and blocking this sweater could have been disastrous. I might've been drowning in owls. So, if you are more like Past Me, and you find yourself too impatient to swatch / block your swatch / block your finished garment, let this stand as advice for you: be ye not so impatient! Proper preparation and finishing will always lead to garments you are happier with in the end, or at the very least, will help you avoid potential disasters before they become the kind of WIP you throw across the room in a fury. Do you have any similar experiences you're willing to share? I'd love to hear about them in the comments! It's always nice to remind each other that we're only human and we have all been there before. Tangentially related: Kate has released a teaser for the first design from Yokes, calleld Epistrophy. She's blogged about here and it can be viewed on Ravelry here. If you're as excited as I am for this book, you'll be happy to know that Yokes should be available to preorder sometime in mid-November!